Brown the mince in a frying pan. Depending on the fat content of the minced meat, there may be no need to add oil, as the meat is often fatty enough. Finely chop the onion and lightly fry in a little butter until clear. Add the onions to the mince along with the mixed herbs and some pepper. Sprinkle the flour over the mixture and stir and cook for 3 - 4 minutes (if using gravy powder, omit this step). Cover with beef stock (or add water and beef bouillon/gravy powder) and simmer for 30 minutes. Peel, chop and boil the potatoes for 20 minutes until cooked. Once the meat is cooked, skim off the excess fat, then boil rapidly to reduce the liquid until it just covers the mince and onions. Drain the potatoes very well until completely dry. Mash until smooth and free of any lumps. Add butter to the mashed potato, taste and adjust the seasoning. Add enough milk to make the mash very soft (heavy mash will not float properly on top of the mince). Put mince mixture in a shallow oven proof dish. Spread the mash on top of the meat and brush the tops of the potatoes with melted butter. If desired, sprinkle the grated cheese on top of the mash. If cooking without cheese, spike the top with a fork – that is, rough up the surface of the mash by dragging a fork across it, as if ploughing a field. Cook in a hot oven for about 30-50 minutes until the top is golden brown. Serve with peas or beans, or other green vegetables. 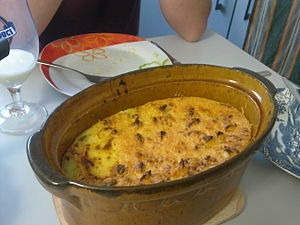 The dish was originally called "cottage pie", dating to the 18th century, with "shepherd's pie" being introduced as a synonym in the late 19th century. The terms are often used interchangeably, regardless of meat, though some specify "shepherd's pie" if made with lamb, and "cottage pie" if made with beef. Adding the butter and milk to the potatoes before they are properly mashed is the best way to make lumpy mash. Roughing up the surface of the mash makes the top crispier, by increasing the surface area and providing thin sections which dry out and crisp faster; compare roast potatoes. Frying the meat in lard can improve the texture and consistency of the finished product, although this also has the effect of increasing drastically the saturated fat content. As with many dishes based on minced meat, the mince can be cooked for much longer in the stock than specified, up to two hours. Some cooks prefer this as it gives longer for the flavour to develop. People often comment that shepherd's pie tastes better when reheated the day after for this reason! A quicker alternative is to add a splash of Cookbook:Worcestershire Sauce or Cookbook:Soy Sauce, both of which act as flavour enhancers. Peel and chop the potatoes. Boil the potatoes for 20 minutes whilst preparing the rest of the meal. Cut the minced lamb and add the chopped garlic. Now add a touch of flour and the water and mix well. Cook in the oven at 200°C for about 15-20 minutes and take it out when the potatoes are turning golden. This page was last edited on 31 March 2018, at 21:49.